I feel like this recipe is just necessary this time of year. 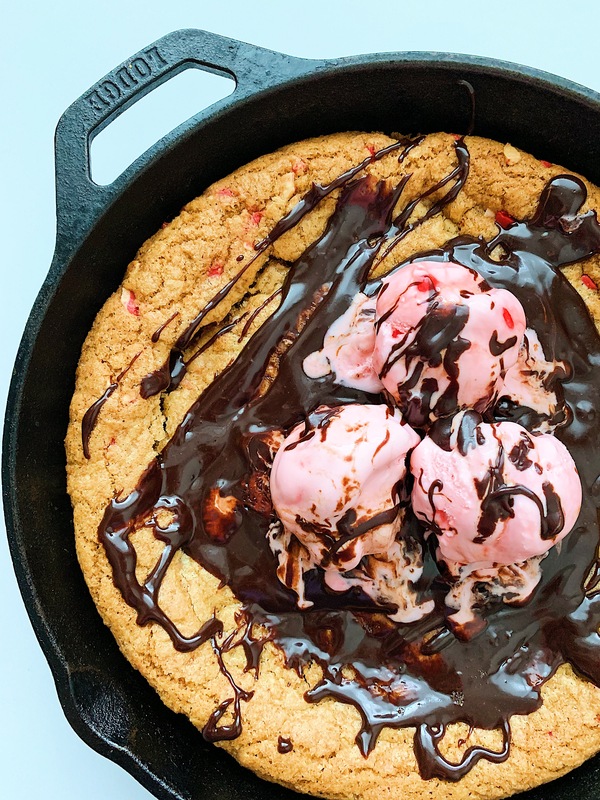 This peppermint skillet cookie is totally naughty, you guys! As far as I know, these skillet cookies have plenty of names. 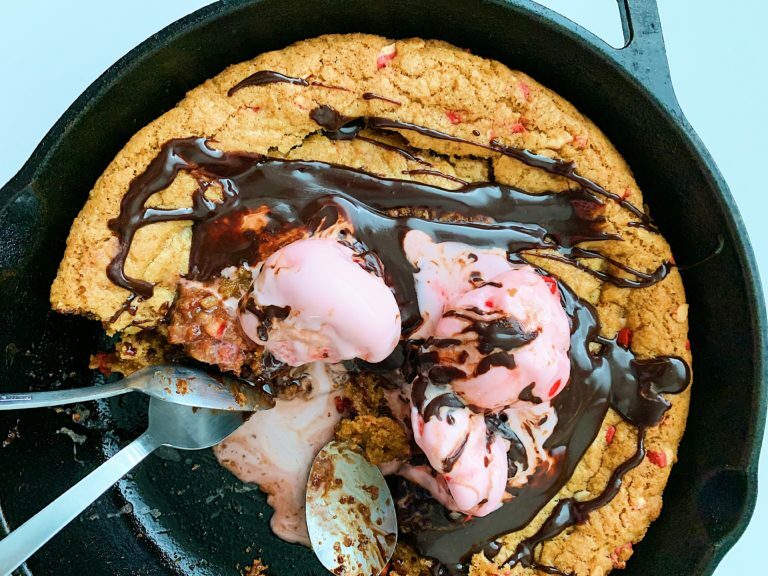 Skookie, pizookie, fizookie–man, what is the correct term for this thing? I’m going with skillet cookie for now. I know one thing: this is an amazingly scrumptious dessert with alllll the Christmas flavors. It’s perfect for just about any occasion, too. In fact, I made a regular skillet cookie for my kiddo’s birthday right after Thanksgiving. I cut the cookie the same as I would cut pie and served it to people on plates. But what I’d recommend is just to eat the sucker straight from the skillet with some of your good friends. You’ll need a 10″ cast iron skillet for this recipe. If you don’t have one, you may want to consider investing in one because they are dirt cheap and one of the best investments you can have for your kitchen. They’re so useful! Now, I smother this thing in hot fudge sauce. I used this recipe from Smitten Kitchen and it was phenomenal. If you’re not up for making it from scratch, just buy it from the store. You can also use chocolate sauce. No judgement here, just get some on that giant cookie. I hope you’re all having a wonderful holiday season and enjoy all the holiday treats! In a light-colored saucepan, melt butter over medium heat. Allow butter to brown in the saucepan, stirring occasionally, until the butter has a nutty aroma and is about the color of graham crackers. Remove from heat and allow to cool. In a large bowl, add browned butter, browned sugar, and salt and stir until well combined. Add vanilla extract and egg, and stir to combine. In a separate bowl, sift together the flour, baking powder, and baking soda. Add dry ingredients to the wet ingredients and stir until just mixed. Add peppermint and chocolate chips and stir until they are well dispersed. 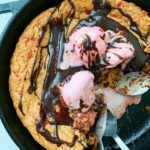 Spread the cookie dough evenly in a 10" cast iron skillet and bake for about 20 minutes, the cookie will be lightly browned. Remove from heat and allow to cool for 10 minutes or so. Top with peppermint ice cream and hot fudge sauce and serve. Enjoy!